Vineyard and winery dogs work hard. Their day-to-day operations include everything from slaloming through vines and greeting new vehicles in tasting room parking lots to munching on discarded grapes from the sorting table and riding shotgun in a forklift during harvest. 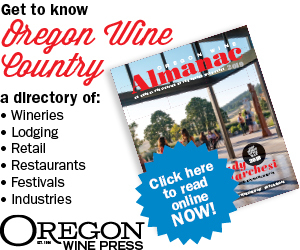 It’s a mostly open-air lifestyle reminding us that Oregon wine is mostly farming and, while rife with quality, shouldn’t be taken too seriously. The vineyard dog is the industry’s loyal mascot, becoming so synonymous with the trade that a vineyard without one can seem: empty. Great fruit and craft beer may help make good wine, as countless winemakers remark, but these stereotypes are so often rehashed while patting Fido on the head. That’s about when wine country’s best friend wanders off to charm a customer into signing up for the wine club, before pawing at the door to make his ritualistic vineyard rounds. Trouble and Gemini are fixtures at A Blooming Hill Vineyard in Cornelius. 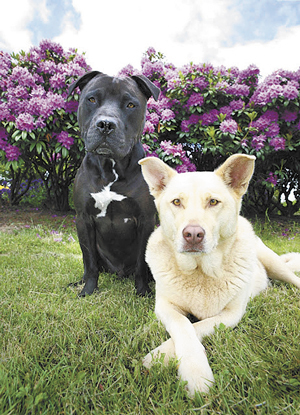 The pit bull-boxer and Labrador-husky work as four-legged ushers, greeting visitors at the parking lot and leading them to the tasting room. 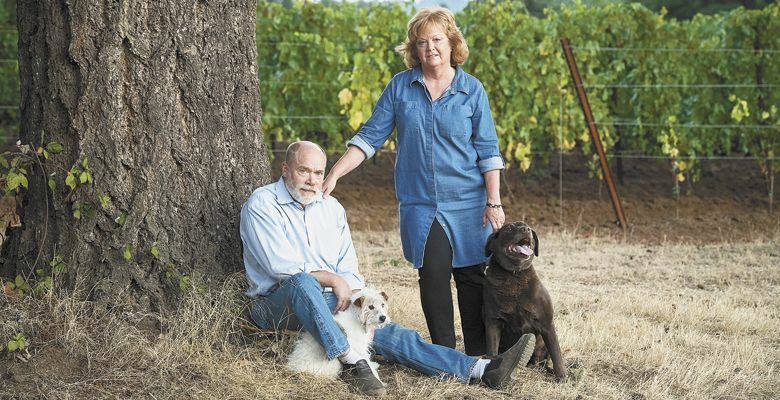 Both rescues have been with owners Jim and Holly Witte since their tasting room opened in 2009. The duo is prominent on social media channels, attends weddings at the vineyard and is responsible for the names of a couple of estate wines. The dogs watch over a site at the edge of the Chehalem Mountains producing Pinot Noir, Chardonnay, Pinot Gris and Riesling. In addition to the warm greetings from Trouble and Gemini, tasters appreciate stunning views of Mount Hood, with a glass of Mingle — the estate’s popular white blend — in hand. 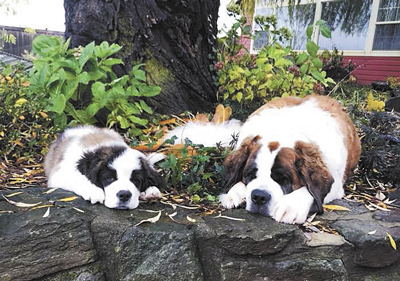 Two Saint Bernards, Sophie Ann, 6 years old, and Gracie McGhee, 6 months, call ArborBrook Vineyards home; the bucolic Newberg estate was homesteaded in 1866. Sophie Ann is a professional tasting room lounger while Gracie McGhee is still learning the trade and is affectionately dubbed a bulldozer by owner Mary Hansen. Being in the company of the giant, lovable breed reminds this writer of Timberline Lodge, the iconic Oregon resort with a locally famous family of Saint Bernard hosts. Winery owner Mary Olson admits winemaker Elizabeth Clark’s wines are the main reason folks visit her Monmouth estate, but Riley and Rocky offer a close second. The Irish setters enjoy frolicking in the vineyard and, in warmer months, taking a dip in the pond. Olson recalls a recent wedding ceremony at a neighbors’ residence where Riley escaped a new fence just in time to greet the bride and groom as they reached the aisle. Meanwhile, Rocky was savoring some of the hors d’oeuvres. The newlyweds took it in stride and remain close with both the dogs and the winery. 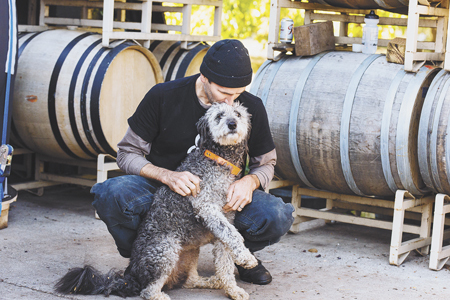 Newberg’s Ayres Vineyard is home to GiGi, a Sheepadoodle who think she’s more human than an adorable cross between poodle and Old English sheepdog. 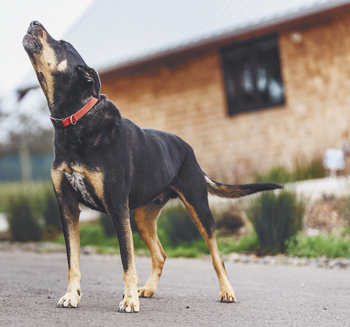 Her owners affectionately refer to her as a micromanager; one of her favorite pastimes is the frequent delivery trip from their Ribbon Ridge setting to Portland with winemaker Brad McLeroy. GiGi was in a noticeable funk after Brad sold the delivery van and continues to look for it to this day. A loyal companion, the dog takes pride in looking after the McLeroy children, especially when they opt for outdoor playtime in the vineyard. 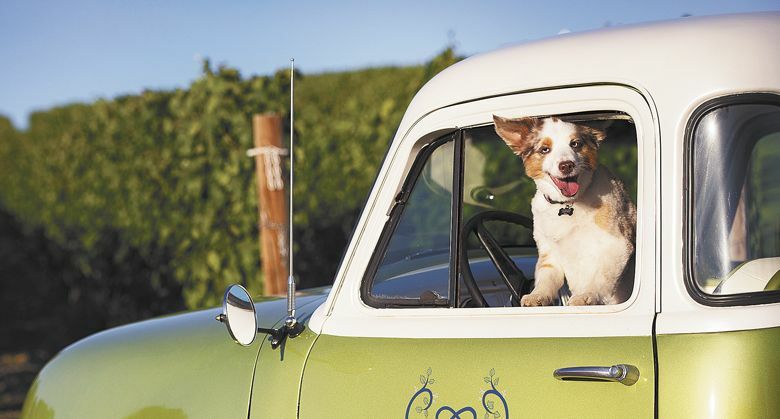 At Arlyn Vineyard in Yamhill County, the fuzzy face of the brand belongs to 6-year-old Australian shepherd, Cooper. The name is a reference to the barrel-making craft, fitting for a dog that doubles as a vineyard manager. Owner Janis Pate adopted Cooper a month before closing on the 40-acre site near Adelsheim and immediately put the pooch to work. Soon, he was helping fetch snags left behind from the removal of hazelnut trees and diligently oversaw the planting of 24,000 vines. Life amid the rows has fostered similar interests — the tractor (riding it), herons, porcupines, for example — and distaste for distractions, as when Pate is on the computer, away from the vineyard. Mac the Springer Spaniel is on vineyard watch at Mike and Anne McCleskey's Horseleap Vineyard in Tigard. The fruit from the family’s small vineyard goes to a few Valley producers and their own eponymous wine labels. Mac’s predecessor, Oliver, was a show dog, but Mac is a pure hunter, ridding the vineyard of pests like gophers, squirrels and birds, sometimes snatching them straight out of the air. “As soon as the door opens,” says Anne, “he runs as fast as he can in a set pattern that includes circling the barn, house and property line.” The well-trained pup is known to get quite muddy during his patrols and is in the habit of rinsing off in his pool before going inside. Stanley, whom his adoring owners believe to be a Doberman and German shepherd mix, joined the Ruby team in 2007 by way of the Family Dogs New Life Shelter in Portland. He’s an avid singer and will join in should you initiate the tune. In fact, if you ask him to sing “Happy Birthday,” he’ll howl right on cue. An asset to the Hillsboro vineyard and winery, Stanley is a natural born greeter who keeps a watchful eye on estate Chardonnay and Riesling, as well as own-rooted Pinot Noir planted as far back as 1973. Olive is a border collie-poodle mix with a keen interest in tennis balls. 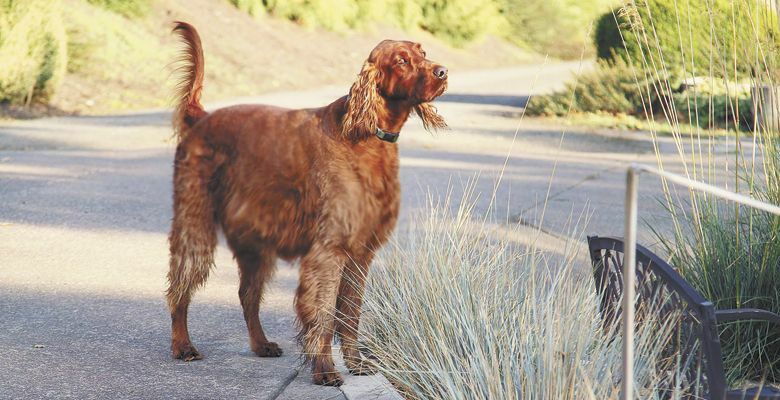 An independent spirit, Grochau Cellars’ pup loves a good outing and almost always returns with a souvenir, like a big chunk of bread from the neighbors. She is winemaker John Grochau’s trusty sidekick, an attentive harvest observer and overall admirer of her Amity tasting room backdrop. The action during crush always appeals to Olive, especially when it involves somebody taking a quick break to chuck a tennis ball. 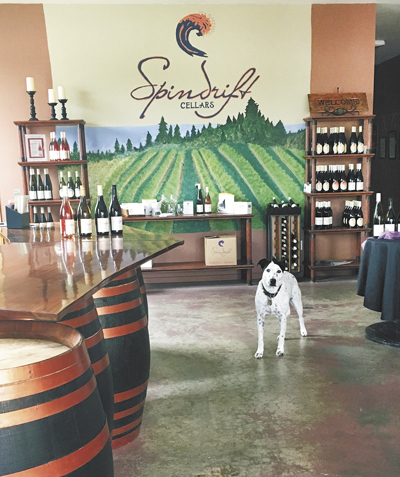 Lola is a Lab/heeler mix with particular taste and stationed at Philomath’s Spindrift Cellars. Her dislikes include frying eggs or bacon and inclement weather. Arguably the most photographed critter at the vineyard, Lola is not above a belly rub and loves to relax at the winery when she’s not working. 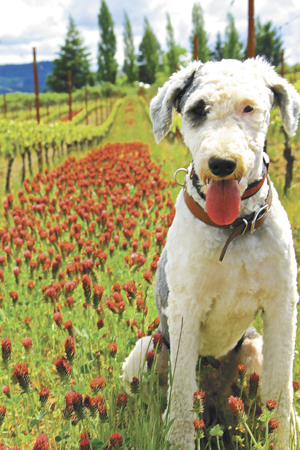 Oregon’s unpredictable weather patterns would seem to spell trouble for the dog, but luckily she’s often too distracted by customers or vineyard chores to be bothered. JosephJane Winery, new to the scene, fully understands the power of the vineyard pooch. 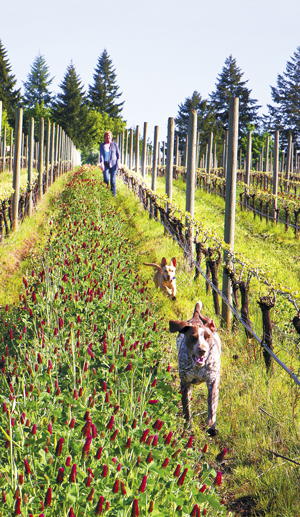 A trio of four-legged friends looks after the Umpqua Valley site, much of it so fresh it’s still being planted. 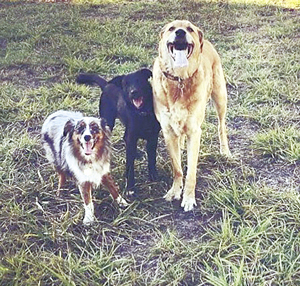 Husband-and-wife team Leon and Kayla Glaser farm and make wine in the company of Kevi, a mini Australian shepherd; Bandit, a mix of mini Aussie, border collie and Labrador retriever; and Tiller, a blend of Great Pyrenees, border collie and Lab. They love tasters about as much as a good run alongside the tractor. 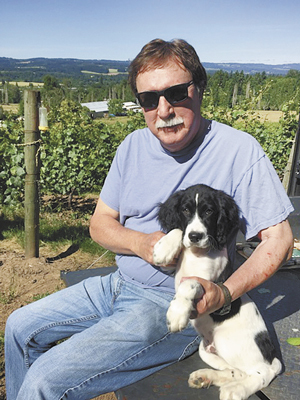 Celia and Ken Austin at Rain Dance Vineyards in the Chehalem Mountains count on the partnership of Emerson, a chocolate Lab, and Bella, a Jack Russell terrier, to manage the property. Celia says the Jack Russells they’ve owned over the years taught the Lab to hunt when she was a puppy. Today, Emerson is known to sit quietly for long stretches near holes, waiting for gophers and moles; her larger size is also good for keeping coyotes away. Bella, now 15, calm and wise, comes from a mother pup the Austins raised more than 20 vintages ago. 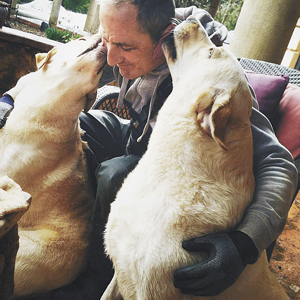 The yellow labs at Pfeiffer Winery in Junction City aren’t picky when it comes to providing licks, getting close to visitors, the vineyard crew and anybody else who enters their southern Willamette Valley domain. Owner Danuta Pfeiffer calls Paco and Bumper as loyal as they come and help with harvest. Bumper weighs in at 125 pounds with no sense of personal space, a lovable trait where dogs are concerned.